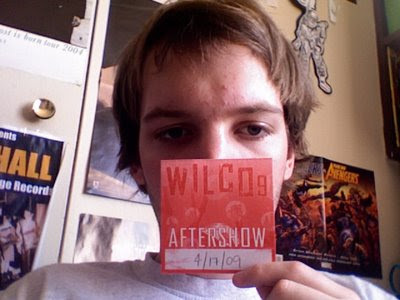 I think it's telling that the prospect of going to a Wilco concert is still something that excites me to no end. Sure, you hear the same songs, but every time I've seen them there's been something that has made that particular experience unique. Back in 2005, I met most of the band before the show at Used Kids records in Columbus, Ohio; back then I was a 16-year old kid meeting rockstars. The year after that I saw Wilco in a festival setting at Tall Stacks in Cincinnatti, a much more communal experience to say the least. The following year I found myself back in Cincinnatti seeing the band at the Aronoff; one of the best sounding venues I've ever been in, and meeting the group again one by one after the show. My experience in my adopted hometown of Athens was an entirely different animal, and possibly the best Wilco-related experience I'll ever have.I made a trip to Memorial Auditorium early Friday to pick up my tickets for the show and ran into Nels Cline on the sidewalk outside the venue. Unfortunately, I wasn't able to put together an interview for my radio show since all those requests have to be approved by management (and Wilco's manager insisted that the band was far to busy to humor a lowly college radio student with an interview). Anyways, Nels was extremely helpful and pointed me in the direction of their tour manager, who gave me essentially the same schpeel. Feeling slightly forlorn, I got a call from my dad (he and my sister came to town to see the show) telling me that he had just run into Wilco bassist John Stirratt, who Jana spotted, with whom he apparent hit it off with, so much so that John put us on the guest list for the show's afterparty. I was ecstatic to say the least, and very impressed with my dear old dad. I made it to the show about halfway through A Hawk and A Handsaw's opening set. After getting to see Low open for Wilco, I think I'm a little spoiled as far as quality opening acts go. A Hawk and A Handsaw were interesting, but not the kind of group that I'd normally peg as a rock concert opener. It was enjoyable enough, but it was obvious that the crowd was fairly eager to get to the night's main attraction. Wilco took the stage and launched into "Hell is Chrome"; certainly one of my favorite songs thanks to it piano-centric nature and also just a great sounding live tune. They also got around to playing "You Are My Face" fairly quickly; one of my favorite songs on Sky Blue Sky and one that I hadn't seen them play live. It was fairly obvious (at least from where I was sitting) that the venue wasn't the best sounding place in the world, there were times where you could hear things bouncing around, but the group really took it in stride. Nels was particularly on top of things, with his solo during "Side with the Seeds" being a highlight of the show. Another great surprise was the A.M. track "Shouldn't Be Ashamed"; those old songs sound so great with this lineup of the band. Tweedy kept fairly quiet during the show, although he did pander to the crowd by replacing the word 'Peking' in "Kingpin" with 'Athens', and told us a story about almost getting hit by a golfball while walking around campus. The night was fairly by-the-book as far as Wilco shows go, but as it was my first time seeing the group in over year, I didn't really mind. Directly following the show, we made our way out back and after Jana and my sister exchanged some words with security, managed to obtain our passes and go backstage. The only other time I'd been backstage after a show was after a Nels Cline and Glenn Kotche solo show at the Wexner Center a few years back, but this was certainly a different experience. Everyone from the band except Jeff was in attendance, and there were maybe 10 or 15 other attendees. John welcomed us in, offering us drinks and thanking us for showing up. We struck up a conversation with Nels, and he told us about some of his upcoming projects, such as a soundtrack to an artbook by Ed Ruscha and the next Scott Amendola Band album (which IS still on it's way, although probably not until next year). For being such a great guitarist, Nels is a very humble guy; he expressed how grateful he was to have a well-paying gig like Wilco that allowed him to work on much smaller, less lucrative projects. Next, we talked briefly with keyboardist Mikael Jorgenson, who was glad to hear that his group Pronto's debut record All is Golden was getting some spins on WOUB. Finally we got to Glenn, a guy who I was really looking forward to asking some questions to, my first one being; What have you heard from Jim O'Rourke about his new album? To my surprise, Glenn said that it was finished, and that he actually had a copy of it, and that it was just as amazing as his previous work. He said that Jim played every instrument on it himself; but being the perfectionist that he is, is still tinkering with it. Glenn also revealed that he and his family had flown out to Japan to visit Jim recently, and that while there he laid down some drum tracks for an entirely different project that Jim is working on. Glenn made it no secret that, like me, he has a huge respect for O'Rourke, going as far as to say that he is the only person he has ever met who he truly considers to be a musical genius. I told Glenn to send my regards to Jim, and to urge him to release an album sometime soon. With that, we took a few more pictures and made our exit, making certain to thank John one more time for his gracious invitation. I don't know if I'll ever top this Wilco experience (maybe Jeff Tweedy taking me out for dinner at Chili's? ), but damn, my 16-year old self would be so jealous of me right now. OK, Thanks for NO mentions on MY pictures and thank you for no praise on being the one who saw John Stirratt in the fisrt place and helped on getting the passes, plus I was the one that had to argue with the security to even GET you to the aftershow, also... its is Ed RUSCHA, I would fix that before you lead a bunch of people to the wrong artist.. its ok though it is a weird name to spell. All omissions noted and rectified.